Hoary thuggish cult of the Redguards who originated in Yokuda during the Twenty Seven Snake Folk Slaughter. Diagna was an avatar of the HoonDing (the Yokudan God of Make Way) that achieved permanence. He was instrumental to the defeat of the Lefthanded Elves, as he brought orichalc weapons to the Yokudan people to win the fight. 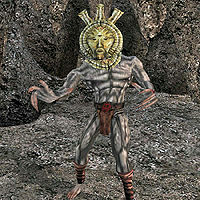 In Tamriel, he led a very tight knit group of followers, called the Order of Diagna, against the Orcs of Orsinium during the height of their ancient power, but then faded into obscurity. He is now little more than a local power spirit of the Dragontail Mountains.